Do you constantly get asked about what your consumers or end-users want? Whether you’re part of a marketing, customer experience or innovation team, there are hundreds of critical decisions that can make or break your initiatives. The best path forward can’t always be found by analyzing existing data or talking to internal stakeholders. You'll often need to go to the source directly and ask your target consumers what they’re thinking. You need an approach that fits the speed your team is moving, so they can build and iterate as they learn. The rise of smart devices and social media-style engagement has led to new online approach to consumer research called a Market Research Sprint. Taking heavy inspiration from the Agile Methodology, Sprints enable you to break free from the cycle of always relying on research that was conducted several months ago—or having to put projects on hold to conduct new research. Simply put, Sprints enable you to develop the internal capability needed to build and learn simultaneously. Market Research Sprints can be done as part of a Design Sprints or as a step in your product, experience or marketing development cycle. Instead of having to spend weeks or even months conducting surveys or in-person interviews, sprints enable you to build and optimize solutions quickly—in a week or even less. We'll walk through these steps in detail and what you can do to ensure an optimal sprint experience. Now that you’re familiar with the tools and resources you need, here are the five steps in a successful sprint. The last thing you want is to conduct research, share the results with your team and then have them disregard the results because they weren’t a part of the process. To avoid this outcome, get the people who will use the research results involved in the process early on. Start by picking a few people who will be part of the design, development and decision-making process (e.g., a product manager, a researcher and a designer). While you definitely want to build a cross-functional team, but be careful to avoid putting too many people on it. Aim to create a small group of between four and eight people. Inform your team that this new approach will give them the answers they need to build better products in a fraction of the time. In return, all they need to do is participate in a 30-minute kickoff call and commit to putting in 30 minutes each day over the week as you design and conduct the research. Part of those 30 minutes we recommend you use daily standup meetings where you discuss what happened yesterday, what is happening today and what obstacles, if any, are holding your team back. Below is an example of a kickoff email. We love the simplicity of this example. As you know, it took us over a month to get feedback on our last project which made it nearly impossible to keep to our timeline. We’re trying a new approach to market research that will allow us to get the answers we’re looking for in five days—which should help us avoid a similar experience in the future. To get started, I need a few of you to commit to a 30-minute kickoff meeting and invest 30 minutes of your time each day this week. Let's get started next Monday. Look out for a new slack channel, Trello board and meeting invites to keep us moving and let me know if you have any questions or feedback. In addition to sending an email, a simple (and often free) tool get started now is Trello. 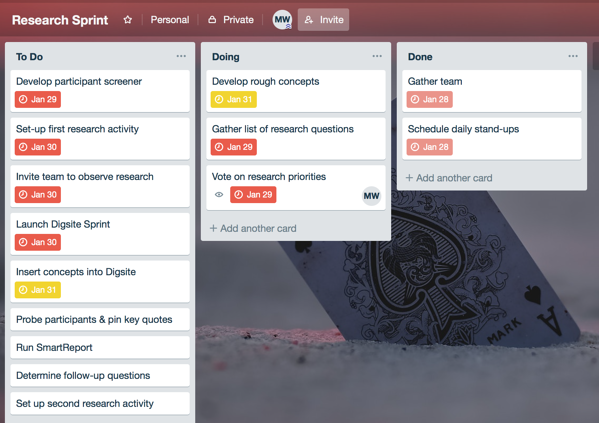 Simple Kanban boards like Trello help to track your to-do list. We recommend a very basic setup consisting of only 3 columns; To Do, Doing, and Done. I would also recommend you setup a Research Sprint "channel" in a collaborative platform like Slack to ask urgent questions and share timely information in real time with your colleagues. The minute you mention you’re going to conduct research, your team might flood you with research questions they wish they had answers to. Your job during this step is to vet the questions and determine which will result in actionable decisions versus which would simply be nice to have or would be better answered later. 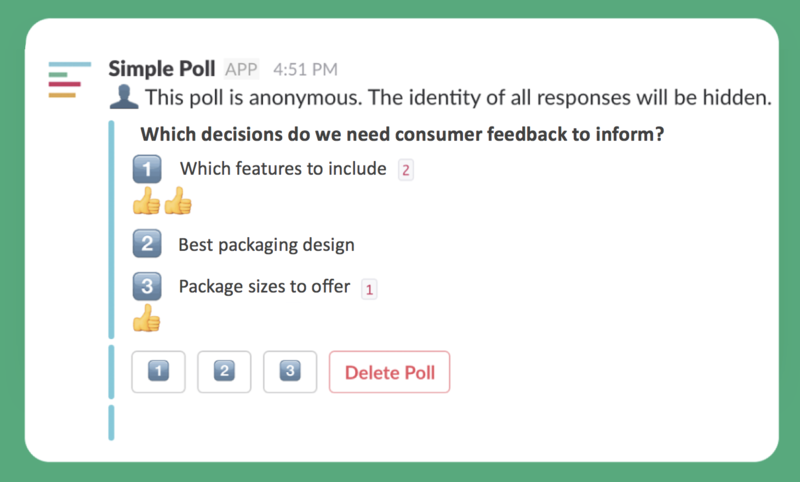 One easy way to figure out which questions are priorities is by linking them to a decision your team is facing and asking your team to vote on the importance of that decision using an online polling tool—like the one Slack has. Once your team has voted on their favorites, match them back to your research questions and prioritize based on which would best inform the decisions you need to make. If you’re working as part of an agile development project, your teams might already have designs they are looking for feedback on. In other cases, the team might have come to you before they had any solutions in mind. If they don’t have solutions yet, ask them to take their best guess at what they will learn from the research and draw up some ideas on what their solution would look like. This could be a few sentences on solutions, mood boards or 2D sketches. Marketing teams often use tools like PowerPoint to create a design while design teams use more sophisticated tools like the Adobe suite. While the team should start brainstorming right away, they won’t have to have designs fleshed out until Day 4. While you might be thinking you’ll need to come up with fully fleshed out solutions for your research sprint, you actually shouldn’t. 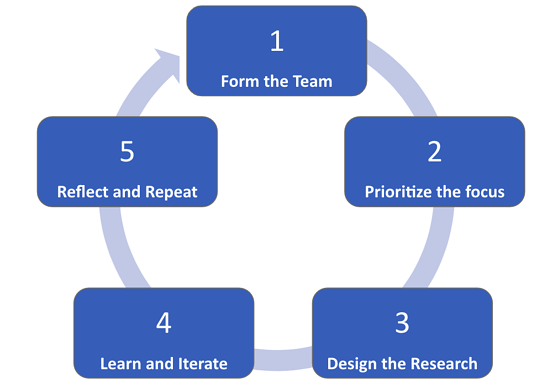 Teams often conduct research sprints prior to development to help inform the development process. However, the process of hypothesizing solutions can help you get further in research, as “pet” ideas get vetted right away. Another priority on Day 2 is to figure out who you want to talk to. If you recruit too broad an audience, they won’t be able to answer your research questions with the level of depth you need. If you recruit too narrow an audience, you’ll kill your budget looking for someone who represents just a fraction of your end users. Focus on a few key demographics and behaviors versus a big list of attitudes. What are they buying or doing now that indicates they might have an interest in your solution? Sprint screeners ideally have 10 or 15 questions on them and take two minutes or less to complete. If you need help recruiting participants quickly, you will want to work with an agile provider like Digsite to pre-target desirable participants and keep your sprint moving fast. Getting organized is the final priority on Day 2. Populate your Kanban board with your list of tasks, who is doing what, deadlines, etc. can be all be assigned, monitored and managed in this tool. When combined with a daily standup meeting, this process gives just enough structure to move things along while minimizing the administrative overhead of a typical large-scale research project. On the third day, it’s time to translate your research questions into your research design. It might be tempting to imagine your research like an online version of a focus group or in-person study. But the best practice for sprints is to focus on behavior and experimentation as much as discussion. In other words, if you have questions about what people are doing now, you may want to have them show you through rich media like photos and videos. If you have a solution, you may want them to use it or interact with a 2D image of it and explain their experience. After participants do these things, you’ll want the opportunity to change the discussion on the fly based on what you’ve learned. Platforms like Digsite offer sprint templates that make it fast and easy to design and set up your research project. These templates enable you to quickly set up your research study while giving you the flexibility to iterate and follow up with participants as you go. Below is an example sprint template. Once you invite participants to join your community, you’ll also want to invite your team so they can observe participants. You can use your standup meetings to make sure everyone has logged in and previewed the activity guide. This will help you make sure your team is ready with any prototypes for tomorrow’s launch. Observation. Ask participants to do the activity you want to observer, or post your concepts and begin to see your participant's reactions. Interaction. Ask clarifying questions and begin to drill down. This is the time to ask the "why" behind the initial batch of feedback. Collaboration. Discuss the early results as a team. If you have design or product folks involved, discuss additional ideas that you could share with your participants for additional feedback. Iteration. Now it's time to share your updated concepts and/or further questions. You can even ask participants to share their ideal solution building on what they've experienced so far. Learning. At the conclusion of this process, you should have a good idea of what needs to be changed and what is perfect as-is. 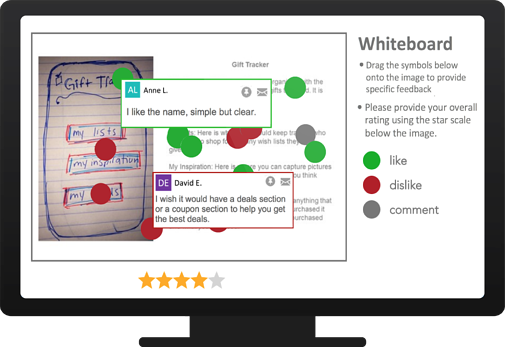 Below is an example whiteboard image markup activity. It's important to understand iteration is key to developing actionable insights during your research. One Digsite customer, for example, uncovered warnings during their research sprint that they weren’t even expecting. They went back and changed what they were doing, taking that feedback into consideration and ultimately developed new ideas that took them in a completely unanticipated direction. You’ve conducted your research and collected the insights you need to build better products and deliver stronger experiences. Now it’s time to evaluate your sprint and determine what can be done to make your next sprint even more productive and beneficial. What went well—and what didn’t go well? Did we have the right participants? Could they provide meaningful responses throughout the process? Could we have asked better questions? Did we have the right people on our team? What could have made the research process more efficient? Were you able to make the decisions you planned to from the research? Most importantly, what are the next steps from here? The goal is to capitalize on your research and make your next sprint more successful. The answers to the questions above will help you understand everywhere improvement is possible across your people, processes and technology as it relates to agile research. By collecting, recording and processing all your key learnings, you'll close the loop on the agile process—so you’re continuously improving. Be sure to revisit these results and key takeaways in subsequent team meetings and at length prior to your next research sprint. Research sprints enable companies like yours to find the answers they need—quickly, efficiently and affordably. To learn more about how businesses can benefit from agile research, check out our whitepaper on how CPG companies, like Palermo's Pizza, are using agile insights for better business outcomes. 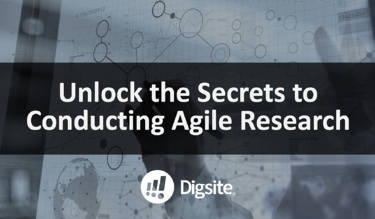 Want to learn more about how to successfully implement or scale agile research within your company? Check out our recent webinar and gain insight on the variety of agile tools and methods available today.